About a 20 minutes drive from the Great Pyramid, and visible from the Giza Plateau on clear day, is one of Egypt’s greatest treasures from antiquity, and one of the most extraordinary places on our planet. Abu Ghurab, or “the crow’s nest" as it is called, is a closed to the public archaeological site in the pyramid fields that run along side the Nile south of Cairo. Egyptologists quaintly refer to it as a ‘sun temple’, a ‘burial center’ or ‘funerary complex’ for a new cult of Ra (they usually use these terms when the actual function of a place is unclear). 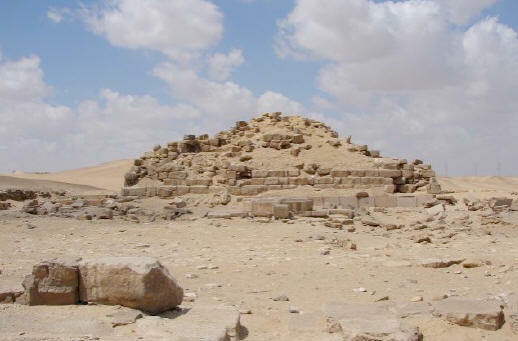 The site of Abu Ghurab is a part of the pyramid complex at Abu Sir. 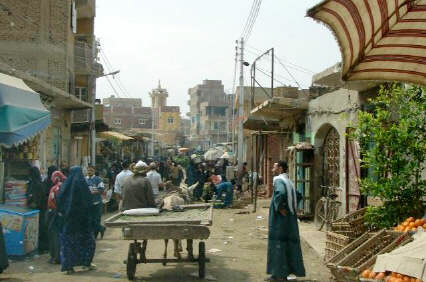 The name Abu Sir comes from the Greek name for this city, Busiris, which in turn comes from Bu Wizzer or Per Wsir, the “Place of Osiris”, the Egyptian god of resurrection. Egyptologists claim it was ‘made’ at the time of the 5th Dynasty of the Old Kingdom Period around 2400 B.C. I use the term ‘made’ for its double meaning. It means ‘created’, but ‘made’ is also a police term for ‘identified’ or ‘discovered’. In fact, indigenous Egyptian tradition teaches that this site is one of the oldest ceremonial centers on the planet and is a place where the ancients connected with divine energies. Later, it was ‘made’ by a pharaoh. I visited the place three times during my stay in Cairo in March/April 2006 and found some eye-opening connections to both Atlantis and to the Anunnaki gods of Sumeria, which will be shared in these pages. literally have no names and life has changed little for thousands of years. 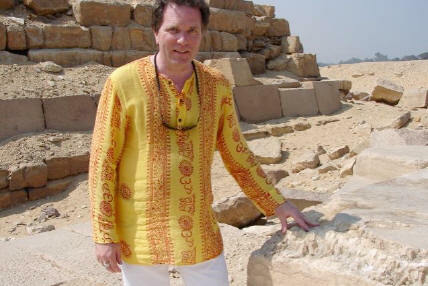 Here is a chance to experience ancient Egypt. On my first visit I was with the National Geographic Channel (NG) who took me to Abu Ghurab to interview me about Egypt’s connections to Atlantis. According to Plato’s version of the story, which originated in Egypt, Atlantis was a high civilization founded by the gods. They built a temple surrounded by a city formed of concentric rings, which was populated by hybrid god-men. When this race lost their ‘divine essence’ this brought about the wrath of Zeus, watching from the center of the universe. I believe that Egypt exists in the shadow of Atlantis. It is an echo of this lost realm. After a short Soprano’s style exchange with the Egyptian authorities that guard this site we entered a narrow path cut through a thick mango grove. When the trees cleared we suddenly entered what felt like a Hollywood movie set for a movie titled Forbidden World, or something like that. The dunes of the great desert appeared lunar. The three pyramids of Abu Sir, about a mile away, seemed surreal like three elder fires burning for eternity. Strangely, when I stepped onto this ‘set’ I have never felt more at home in a place in my life. I could hardly wait to get up over the crest of hill in front of me and cross the barrier to Abu Guhrob. As I mentioned to NG on the way up crest of the hill, to the prophets of the past peace was not the absence of conflict between warring factions or jealous religions. Peace is the unity of heaven and earth. Was Abu Ghurab where the stargate connection was made? 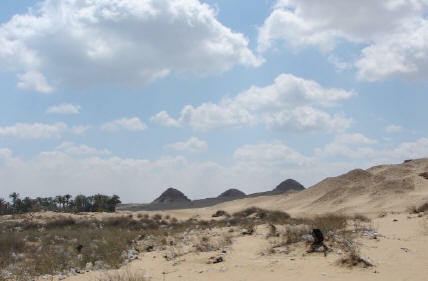 The Three Pyramids of Abu Sir about a mile south from Abu Ghurab. After a short walk we entered the gate of the complex. We were alone. The only sound was that of sand and ancient stones crunching beneath our feet… and a mammoth C-5 military aircraft flying low above us. The stepped pyramid with the alabaster hotep sitting in front of it greeted us. The site appeared as if it had sat undisturbed for millennia. Everything I knew about Abu Ghurab came from Stephen Mehler, author of Land of Osiris and From Light Into Darkness, and conversations with researcher Bob Vawter. Both men are top-of-the-class students of Abd’El Hakim Awyan, the acclaimed teacher and wayshower of the sacred mysteries of ancient Khemet, the early name for Egypt. According to Hakim, there exists an immense, relatively unknown oral tradition in Egypt that tells the actual history of Khem. One cannot fully learn this knowledge. Instead, one is ‘gifted’ with it. Khemet is related to the word alchemy, Al- Khem or Chem, and is thought to designate the mysterious Black Land formed by the Nile. Interestingly, Indian scholars trace it to the Chinese Chin-I or Chin-je, meaning “Juice of Gold.” This alternative definition will appreciate exponentially in significance in a moment once we cross the threshold of the gates of knowledge at Abu Ghurab. According to traditional Egyptological theory, Abu Ghurab was built by the 5th Dynasty pharaoh Niussere around 2400 B.C. Known as “the favorite of the Two Ladies” (lucky man) and “the Golden Falcon is divine” he built the temple to worship the god RA or RE (‘ray’). 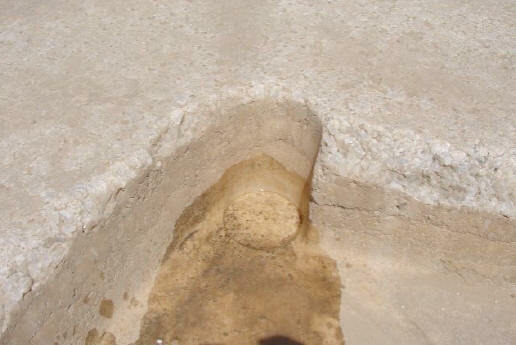 The mound at Abu Ghurab. 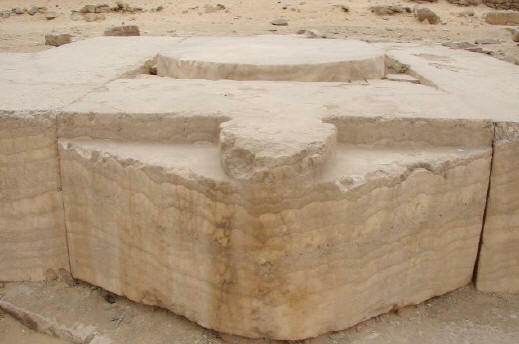 The massive alabaster (Egyptian crystal) platform at Abu Ghurab. 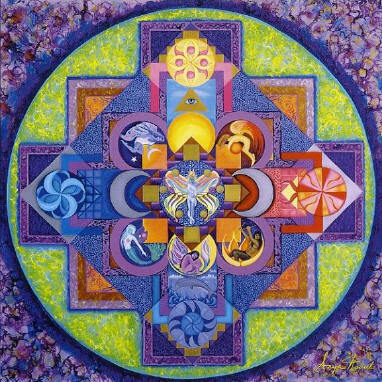 It is a mandala depicting the four directions. An obelisk (‘sun stick’) once stood atop this mound. 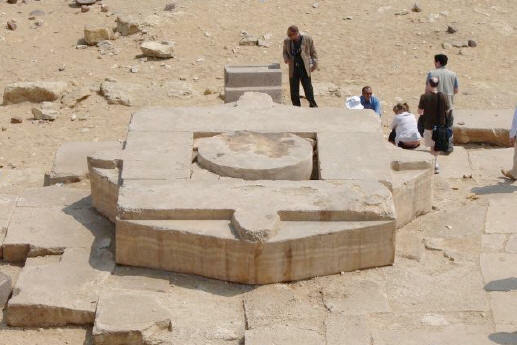 Egyptologists say it was likely around a squat 15 feet tall and was modeled after the sun temple at On or Heliopolis, the site where Akhenaton, and other enlightened ones, was initiated in the esoteric mysteries that made them great mystics. Pieces of this original sun stick or ben ben are scattered all over the place. In fact, the entire site is one giant debris field with pieces of limestone scattered everywhere that appear to have come from structures that once existed here. According to Mehler’s account in Land of Osiris, ancient Khemetian oral tradition says Abu Ghurab was already ancient by the time of the 5th Dynasty. Hakim claims this bird’s nest dates deep into pre-history and is one of the oldest ceremonial sites on the entire planet. Moreover, he says the site was designed to create heightened spiritual awareness through the use of vibrations transmitted through the alabaster and other materials. This expanded awareness enabled one to connect with the sacred energies of the universe known as Neters. In Land of Osiris Mehler notes that indigenous tradition teaches that the Neters themselves, in some sort of physical form, once “landed” and appeared in person at Abu Ghurab. It is for this reason that this site has been considered sacred for thousands upon thousands of years. Hakim proposes the alabaster platform created a harmonic resonance through sound vibrations to increase the heightened awareness and to further open the senses to “communicate” and be one with the Neters. Of course, Hakim is describing what is called a “stargate” today. The circular center of the alabaster platform. The perfectly smooth sides of the platform suggest advanced machining. Perfectly circular ‘drill’ mark on the alabaster platform. Is this also evidence of advanced precision machining? I am highly intrigued by the re-collections and re-memberings concerning the Neter in the Khemetian tradition. Particularly since Ancient American oral tradition from Tennessee, where I live, retold by Cherokee wisdom keeper Dhyani Yahoo says that formless “thought beings” called TLA beings rode a sound wave from the Pleiades star cluster through a hole in space in East Tennessee and created the Cherokee. All humans are dream children of these angels or elemental forces who came from the stars. This legend obviously resonates with Khemetian belief concerning Abu Guhrob. In addition, before my trek to Khem my research was focused on the profound work of Dr. Eve Reymond, a scholar who had explored the ancient Egyptian Building Texts from Edfu, Egypt in her book The Mythical Origin of the Egyptian Temple. These little known texts also tell of formless beings who came from the stars and created an island civilization in Egypt. These Sages, as they were called, constructed an original mound where the creation of human kind took place. This island was called the Island of the Egg and was surrounded by the primeval water. By the edge of this lake was a ‘field of reeds’ (Aaru), a fact which will have enormous significance momentarily. The Edfu tale matches the Atlantis story as told by Plato of a civilization founded by the gods who created a hybrid race of humans. I believe the Edfu Building Texts are the source material for Plato’s story of Atlantis, which he originally learned from Egypt. I further believe that shards of this tale are found in numerous indigenous traditions, and that it may even relate to Abu Guhrob. The connection is found in the stones. One telltale characteristic alternative researchers uphold as a trademark of Atlantean temple building is the use of megalithic red granite blocks. 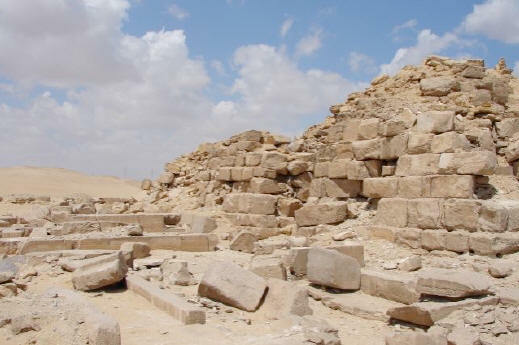 of the pyramid at Abu Guhrob is a trademark of ‘Atlantean’ construction. At Abu Gharob one sees colossal red granite blocks weighing several tons that were precision cut, polished and mounted in place as facing stones on the pyramid. Whoever laid these in place had an accuracy that was extraordinary. 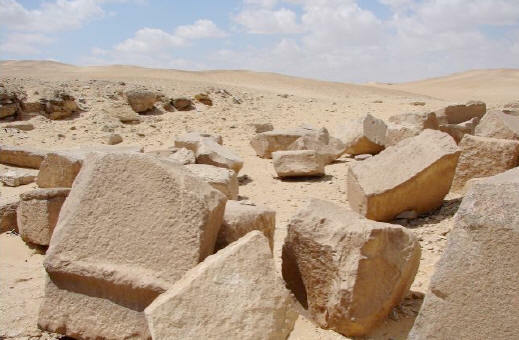 Then, some unknown force caused these casing stones to be scattered like Lego blocks. The whole place looks as if a massive hand had swatted it like a sand castle. In fact, one gets the compelling feeling that this place was intentionally destroyed by a massive show of force. On my second visit to this ‘stargate’ I learned why this may have been done. As NG cameraman, Rich Confalone, and I surveyed and studied the place together we both agreed that this was one of the strangest places we had ever been. Rich is a veteran videographer who during the past 18 years has been to virtually every corner of the globe. He’s the cameraman for Josh Bernstein, host of the hit History Channel show Digging for the Truth. He’d said he’d never dug in such mysterious sands before. About the time I had finished my interview with Rich and the National Geographic producer, Cara Biega, an alarm sounded among the temple guards. Suddenly, they were telling us in hostile voices that it was time for us to leave, like now. Undeterred, the National Geographic team continued gathering shots while I ran interference with the guards. Massive granite blocks are strewn about like Lego blocks. Some titanic force must have scattered these stones. On the way out we took time to examine another of the oddities at Abu Guhrob. 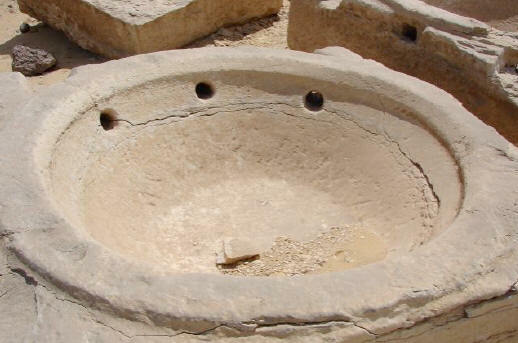 Set apart from everything else we had seen were giant square alabaster “dishes” or “basins” with strange gear-like designs on top. 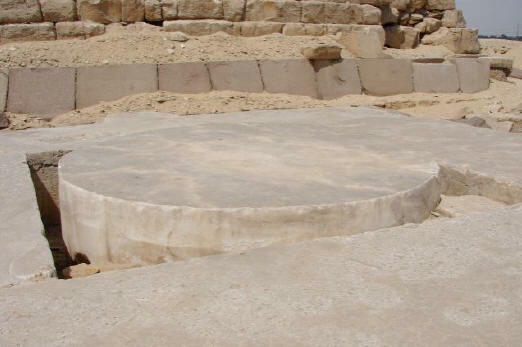 Egyptologists guess that the massive basins were used to hold sacrificial animal blood, which ran through perfectly round channels cut into the paving. There is not a single drop of DNA or other evidence to support this misconception. Interestingly, the inner surface of the basins are amazingly smooth to the touch and show signs of circular tool marks, suggesting that whoever crafted them did so with a technology we would admire today (and make fortunes marketing, too). A bunch of the ‘offering basins’ are lined up near the entrance, apparently placed there at some point enroute to another location. Significantly, a few more are still ‘in situ’. 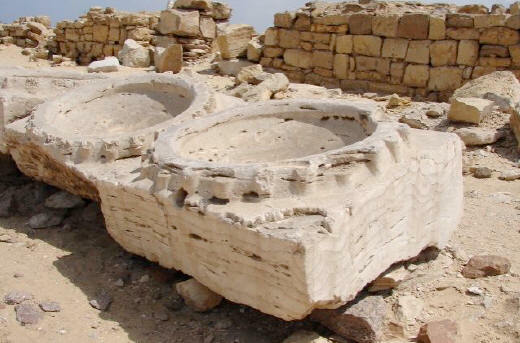 Two square alabaster basins with strange gear-like tops. Beautifully round holes in the ‘basins’. What are they for? How were they drilled? A few days later, the total eclipse of the Sun was approaching. Our ‘cosmic bus’, ‘the Lady Isis’, eased to a stop beside a canal near Abu Guhrob. From the window I noticed that the only way across this particular canal was a bridge made of the trunks of palm trees. One misstep on this bridge and one would find themselves amalgamating their bodies in a vat of ‘the Nile cocktail’, the filthiest water imaginable. My second trek to Abu Ghurab would prove to be much different from the first. The people that accompanied me there made the difference. One of the greatest pleasures an author can have is to interact with people from the imagi-nation (which fellow traveler Bryan Gore calls the greatest “nation” for man) who passionately follow their bliss. On this day I participated in a meant-to-be dance of souls that was pure cosmic poetry. The primary cosmic dancer was Ted St. Rain (www.lostartsmedia.com). Any one who has attended a major UFO conference in the past ten years will recognize Ted as the ultra-frenetic video guy who always seems to be running. What many may not realize is that Ted has an astounding grasp of the ancient mysteries, an understanding that comes from face to face interactions with a who’s who of alternative researchers. Name a UFO, alternative science or ancient history researcher and, chances are, Ted has video taped every major lecture they’ve given. And mastered their material, too. He’s traveled to Lebanon, Egypt, Palestine and Syria with Sitchin. Few know this genre better than Ted. I’m not sure when the first domino began to fall in Ted’s mind. However, after only a short time at Abu Ghurab (his first) Ted proclaimed that he had the answer to the question of the purpose of this temple site. In his Earth Chronicles series of books Sitchin claims that a race of extraterrestrials called Anunnaki came to Earth over 450,000 years ago in search of gold. In addition to surface mining the Anunnaki used sophisticated water mining techniques to ‘filter’ or the process gold from the waters of Earth. Abu Ghurab, it seems, may be one of their processing plants. The Lost Realms is about the massive pyramids of South American and MesoAmerican cultures and their interactions with gods who set-up pyramid/workshops there. Sitchin cites the Mexican pyramids of Teotihuacan to support his theory. There are two pyramids – the Pyramid of the Sun and the Pyramid of the Moon – with the Avenue of the Dead running between them. Some scholars believe the Teotihuacan complex was begun 6,000 years ago and was known as the Place of the Gods. The Pyramid of the Moon is an earthen mound. Some 2,000 feet to the south the path of the Avenue of the Dead reaches the Pyramid of the Sun. These pyramids are virtually identical to the Giza pyramids. Sitchin believes that there is no doubt that the designer of this complex had detailed understanding of the Giza pyramids. The most remarkable correspondence noted by Sitchin is the existence of a lower passageway running underneath the Pyramid of the Sun. As Sitchin records, in 1971 a complex underground chamber system was discovered directly underneath the Pyramid of the Sun. A tunnel, seven feet high and extending for almost 200 feet, was also discovered. The floor of this tunnel was divided into segments and drainage pipes (possibly connecting to an underground water source?) were found. The tunnel led to a strange hollowed out area shaped like a cloverleaf and supported by adobe columns and basalt slabs. The enigma posed by this mysterious subterranean facility was amplified for Sitchin when he observed a path of six segments running along the Avenue of the Dead. These segments were formed by the erection of a series of double walls perpendicular to the course of the Avenue. These six compartments are fitted with sluices at their floor level. Sitchin proposes that the whole complex served to channel water that flowed down the Avenue. This complex, says Sitchin, was an enormous waterworks, employing water for a technological purpose. This ceremonial center, notes Sitchin, has artificial water channels running through that diverted water from the nearby San Juan river. The water is channeled into the Ciudadela, a quadrangle that contains at its eastern side a third pyramid, called the Quetzalcoatl Pyramid. Interestingly, in my lectures at Gouda Fayad’s Tree of Life Conference Center beside the Giza Plateau, I had admonished my tour group that we will be ‘following the water’ in Egypt. Little did I realize at the time that my intuition would prove so accurate. As Ted continued his brainstorm at Abu Ghurab, he noted a key discovery at Teotihuacan. Underneath the Pyramid of the Sun archaeologists discovered mica, a dielectric mineral composed of delicate crystal that is a semiconductor. The word “mica” is thought to be derived from the Latin word micare, meaning to shine, in reference to the brilliant appearance of this mineral (especially when in small scales). Mica has a high dielectric strength and excellent chemical stability, making it a favored material for manufacturing capacitors for radio frequency applications. It has also been used as an insulator in high voltage electrical equipment. Sheet mica is used as an insulating material and as a resonant diaphragm in certain acoustical devices. Sitchin was perplexed by the presence of this mineral beneath the pyramid. Then he remembered the water flowing from the San Juan River and how it was artificially channeled to this site. What he proposed is that the river was channeled along the Avenue of the Gods and underneath the pyramid. Through a chemical reaction caused by the mica (or, I wonder, could it have been a harmonic process?) gold was pulled from the river water. Drainage holes are spread throughout Teotihuacan. Sitchin theorizes these were used to sluice the gold into chambers where the Anunnaki could collect it. 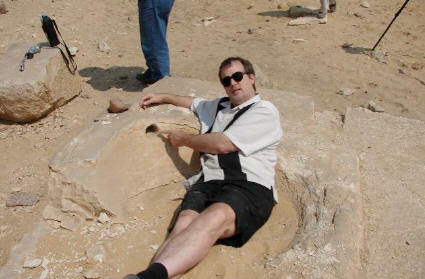 “Just like you see here,” said Ted, pointing to one of the massive square alabaster basins or sluices at Abu Ghurab. Indeed, the Abu Ghurab site was beginning to look a lot like the Teotihuacan site. Those basins, it turns out, were decanters. The only thing missing was the mica. Ted St. 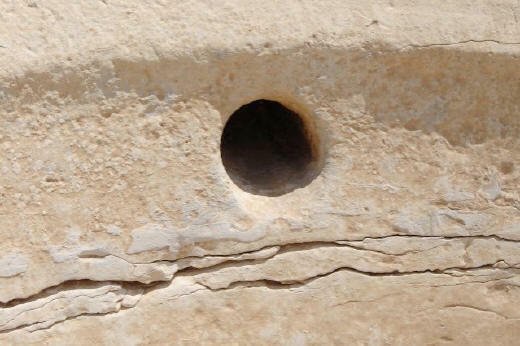 Rain points to a drainage hole in one of the in-situ alabaster basins. That’s when Lady Isis intervened. Another traveler in our group was Anya Nadal, an artist and author of Holographic Mandalas (www.eternalimagery.com), who is also a very knowledgeable ‘rock hound’. It didn’t take very long before she called us together to show us something remarkable: huge sheets of mica in front of the pyramid. Ted was elated with this discovery. Anya Nadal points to the huge sheets of mica in front of the Abu Ghurab pyramid. “the theory is that, like Teotihuacan, Abu Ghurab was a gold refining facility.” (Or, may I suggest, a ‘juice of gold’ production plant?) “What they would do,” Ted proposed, “is bring gold laden water in from the Nile. It would flow over the mica sheets (which may have covered this entire site)." Through the piezoelectric effect produced by the mica electricity was produced. The water would be channeled into the basins and would be spun around inside and flow up and out through the round holes in the sides. The gold (or again, how about the juice of gold?) would filter down and remain in the basins to be scooped out at the end of the day. 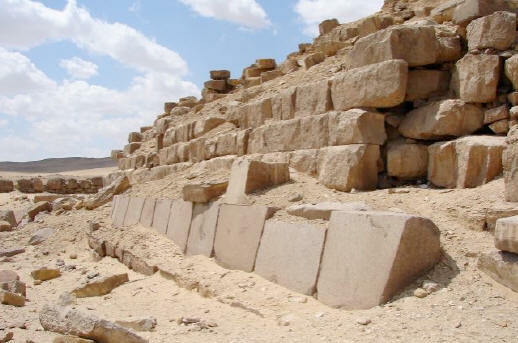 In its original state the Abu Ghurab pyramid may have been a giant machine, especially a water processing plant. We have to imagine water everywhere, in pools in front of the pyramid and perhaps even flowing down from the top of the red granite faced pyramid like a fountain. The “juice of gold” produced by the piezoelectric effect of the quartz crystal-laden red granite may have been one of the products of this plant. We left Abu Ghurab in high spirits that day. For me, it ranks at the top of the list. Everything I had experienced at Abu Ghurab was ringing in my being when I left Egypt. I wondered it were possible if this – the oldest ceremonial center on the planet - is the original Island of the Egg referred to at Edfu and the original stargate of the gods. The moment I returned home I hit the books and was intrigued by an initial finding. As noted, the Edfu Texts say the primeval water surrounded the Island of the Egg. By the edge of this island was a ‘field of reeds’ (Aaru). The use of the word reed is very important. It establishes a link between Abu Ghurab and Teotihuacan. The classic Maya used the word “puh” which meant cat-tail reed, to refer to Teotihuacan. Although tribes of ancient Mexico reported that they came from a place where reeds grew, no location associated with reeds has been identified as their place of origin. I believe in coincidences, but like a UFO, I’ve never seen one. In my view, the appellation, “place of reeds,” that identifies both the Egyptian Island of the Egg and Teotihuacan ties these places together. The apparent similarity in purpose of Abu Ghurab and Teotihuacan links these two places together and ties them to the Island of the Egg, the place or stargate of the gods. Tic-tac-toe. All three places are explanatory of one another. Abu Ghurab is far older than Teotihuacan. Is it possible, therefore, that this site is the original home of the tribes of ancient Mexico? Interestingly, another name for the place of reeds is Tollan or Tula. The T-L-A root connects with the Cherokee legend of the T-LA beings who came from the Pleiades and settled in East Tennessee. The T-L-A vibration is also encoded in the place name Atlantis. One additional ‘coincidence’ worth mentioning involves the artwork of Anya Nadal. 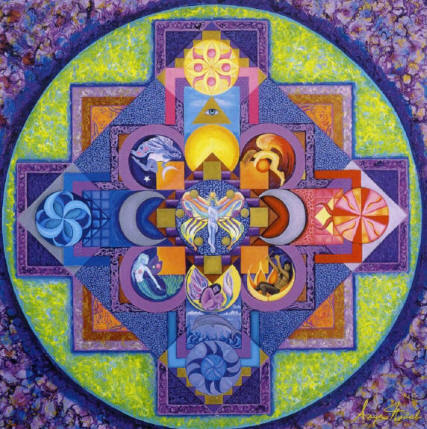 Shown on the next page is Anya’s painting entitled Wisdom from her book Holographic Mandalas. On the next page is the alabaster platform at Abu Ghurab. Not only do the outer patterns of these mandalas match, but also both have a circle in the center. Anya later told me she immediately recognized the similarity upon seeing the platform. 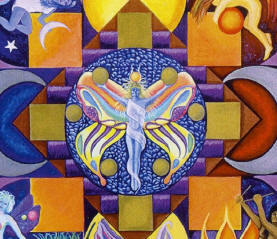 She calls the ethereal being in the center of her painting an ‘Atlantean fairy’. Hmm. I wonder. Could she have tapped into the ‘stargate consciousness’ of the formless beings, the Neters, who came to Abu Guhrob deep in prehistory? 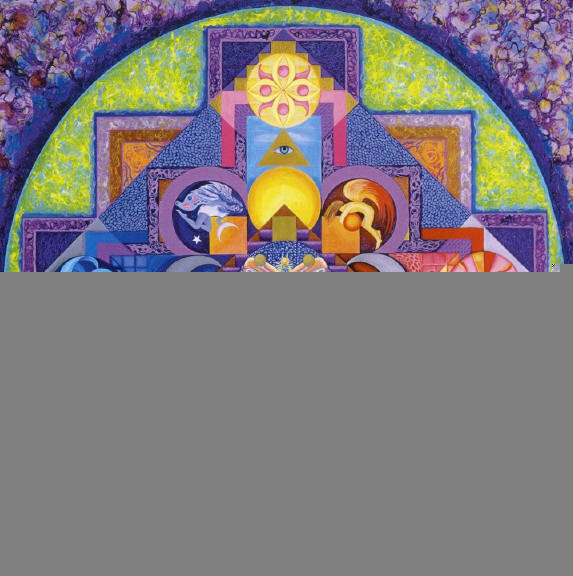 at the center of Anya Nadal’s mandala titled “Wisdom”. Wisdom, a painting by Anya Nadal, bears a striking similarity to the alabaster platform at Abu Ghurab. Anya’s mandala’s are a form of visual meditation that combine colors and sacred geometry to amplify heightened states of awareness. Gaze at this mandala and connect with hidden parts of yourself. 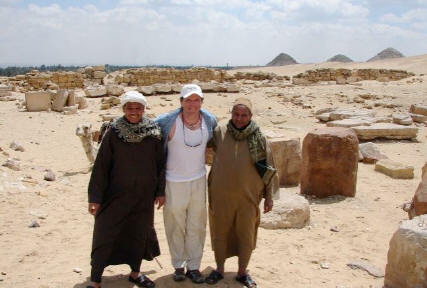 William Henry with the temple keepers at Abu Ghurab (top) and standing beside the alabaster platform (bottom). When people discover strange or unusual things on our planet, such as pyramids as gold processing plants or giant alabaster landing platforms, there are, generally speaking, two paths one can take. They are discarded as meaningless out of place artifacts. The inner eye of light closes. Or, they are exalted as evidence of a lost advanced civilization. The inner eye of light opens. With luck I will one day return to Abu Ghurab to bask in the rays of Ra. I am certain there is much more here than meets the eye.